Rome-based artist Davide D’Elia’s work relies on environmental installations and a thoughtful use of colors. His research on the notion and impact of time over places and individuals has become recognizable thanks to the use of the iris blue antifouling painting flooding the exhibition spaces. Where’s Art catches up with Davide D’Elia to know more about the use of such an unusual medium, his background as a graphic designer and key artworks in the artist’s repertoire. 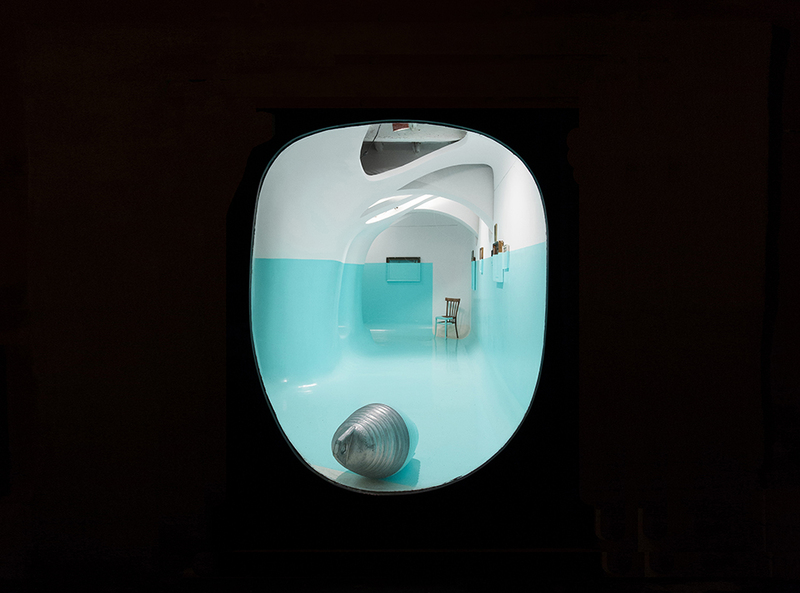 Davide D’Elia, “Antivegetativa“, 2013, installation view, intervention of antifouling paint on vintage painting and objects, Ex Elettrofonica, Rome. Photo: M3S Produzioni fotografiche Roma. Image courtesy Ex Elettrofonica. Davide D’Elia, ”Yesterday I distractedly called upon my mind memories not mine… (I was by them enlivened). 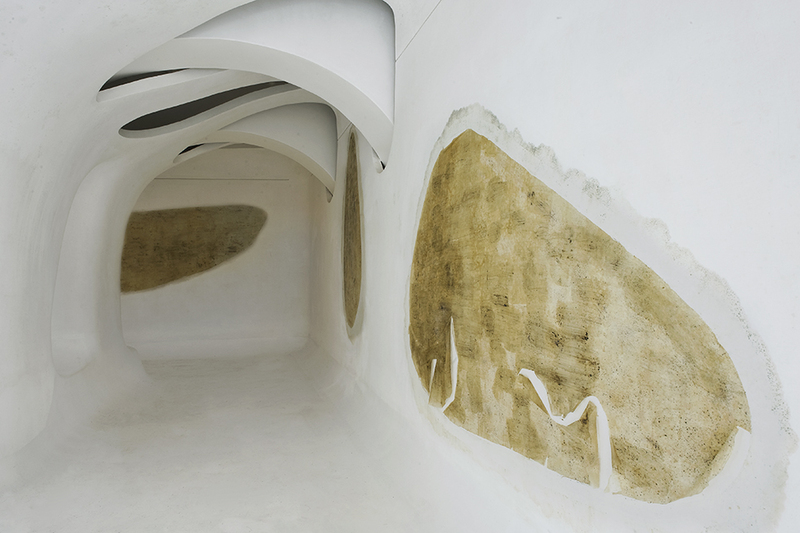 f.p, 2010, installation view, 7 ovals moldy directly on the gallery walls, Ex Elettrofonica, Rome. Photo: M3S Produzioni fotografiche Roma. Image courtesy Ex Elettrofonica. Let’s start from the very beginning. Can you tell me when did you start using the antivegetativa (antifouling) painting? How did it come and why? The true beginning was in 2010. After a series of experiments with mold cultures on various surfaces, I created a living installation in the Ex Elettrofonica space for the exhibition “Ieri distrattamente..” (1), by cultivating mold directly onto the gallery’s curved walls. I called these ovaloid cultures “dowsing frescoes”, as contrary to traditional frescoes these benefited from the humidity in the air, translating into deliberate abstractions. Control over these natural occurrences became part of my practice and the construction of this process turned into the prevalent feature of my personal alphabet as an artist. Then followed the works with vintage frames, transparent millimetre paper, petri plates, passe-partout, and slides in which I placed mouldy canvasses in the making. As a seemingly logical consequence, it so happened that whilst discussing the painting process of a small boat named “giallone”, which I hope still exists, I started to make use of anti-fouling paint, since it is used to counter atmospheric reactants and their resultant harmful proliferations. I began to employ this material for drawing, circumscribing, erasing or re-defining: objects, canvasses, spaces, and partial or entire structures. Your research deals with time and space. 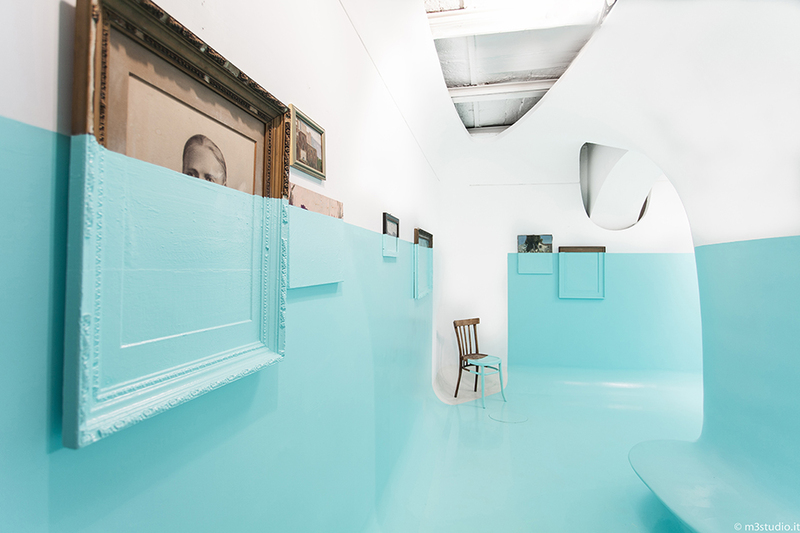 I can see your attempt to stop the flow of time by covering objects with your distinctive antifouling painting – with a “Tiffany blue” shade – that also causes an alteration of the space. Can you expand on your interest in time and space? I will take this opportunity to point out that mine is not so much a Tiffany blue (which would be more a sea green than a copper green) but rather an iris blue, the one that is used to waterproof swimming pools. It is an interesting tone of blue, as its chromatic mimicry of water functions as a Bait-and-switch for the onlooker, while its chemical composition contrasts with the relentless proliferation of life. The partial colour grading changes the experience of space, crystallizing into an absolute tonal value against which the warm tones are enhanced, and which time fractures in various nuances. The space turns into a sort of mortuary, perceived as such because of the unnatural essence of the objects within it. Davide D’Elia, ‘S. 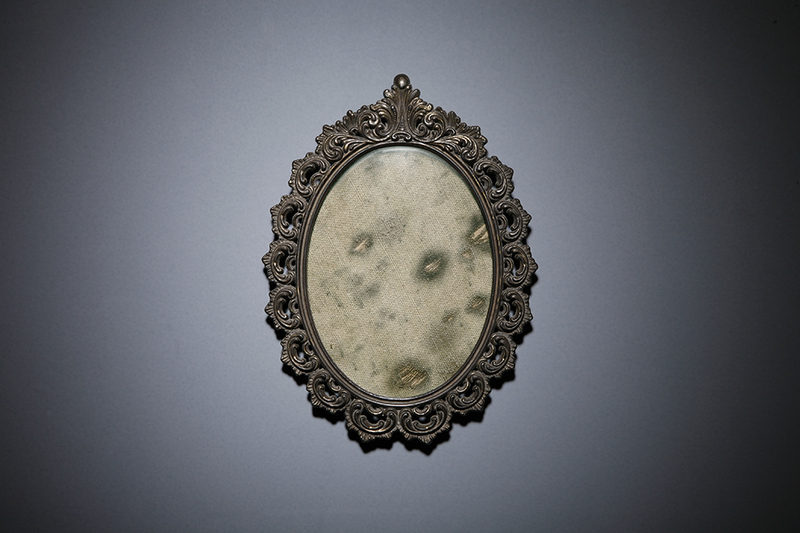 Arcangelo’, 2005, moldy canvas in vintage frame. Private collection. Photo: Delfina Todisco. Image courtesy the artist. I might have a different reading of your work, perhaps a bit more noire. You apply the antifouling painting over objects, walls and floors to protect them from natural agents and guard their existence over time. However, the painting you use looks to me invading spaces and objects, overwhelming them and destroying them eventually. Let’s say that I see in your work the “dark side” of death prevail over life, although with celestial hues. How would you comment on such interpretation? “Noire” may be one of the best compliments for this work, not in the sense of floating skulls and bodies on the river Thames, but I like the fact that subtleties in my work can be understood in their different layers and meanings. In fact I hope that after the very first impression of warm and accommodating immersion, these “anti-fouling” works may leave room for a second, more complex perception, a motionless and icy third dimension which in its intangibility leans towards a two-dimensional infinity. These interventions entirely or partially engulf objects or a space, not only conceptually, but in a way that with time will perpetually continue on one hand and will crystallize in a specific moment on the other. As a matter of fact, rather than “Noire”, what comes to my mind is that 80’s Hollywood film “Death Becomes Her”. 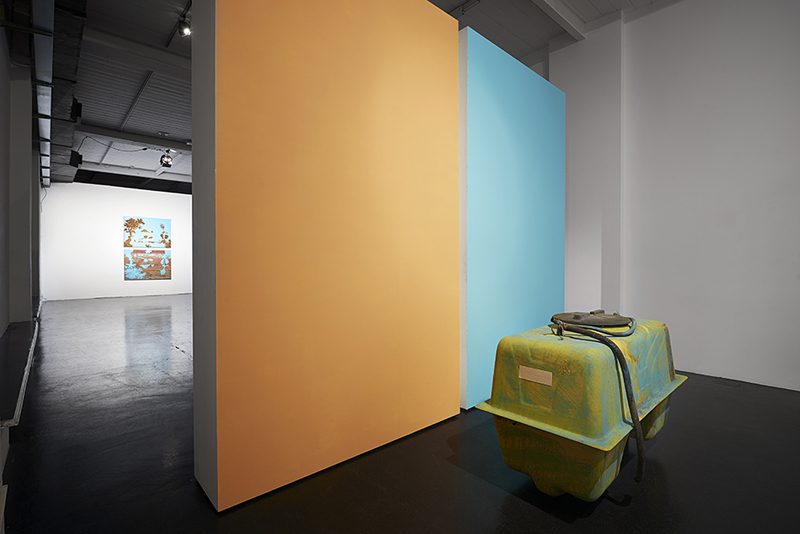 Davide D’Elia, “Limbo’s Lingo“, 2016, installation view, intervention of antifouling paint on vintage painting and objects, verdigris machine, Ottozoo, Milan. Photo: M3S Produzioni fotografiche Roma. Image courtesy Bibo’s Place Todi and Ottozoo. Let’s talk about “Limbo’s Lingo”, your latest solo show at Otto Zoo in Milan. Can you explain to me the latent presence of religion within the show? I am referring to both the term “Limbo” in the title as well as to the “Bolo”, the agricultural machine that you placed at the very entrance to the space, and that the press release describes as “a simulacrum of the concept of artificial versus natural, a thing created by the man to make a plant grow sacrificing others.” Would you expand more on this? Limbo’s Lingo (2) is an installation with claims to perfection which are declared by its title: it speaks of a moment in limbo in my artistic language, a self-defined lingo which anticipates the judgement of the new environment where my work will be shown. The even and candid space of Ottozoo, with its rhythmic and expanding mobile walls, immediately suggested a centred installation, a kind of perceptual temple. The Verdigris machine (which I named BOLO in homage to my brother) is posited as a sacrificial altar in the centre of the installation, and acts as a symbol or better as an arbiter between life and death. Bolo as roman emperor, showing his thumbs down to the gladiators, flooding the space with copper loaded vapour, sacrificing any “other” substance in favour of the desired fruit. Davide D’Elia, ‘Louise’, 2012, wallpaper, nails and picture hooks, installation view at Maxxi (Museum of Arts of the XXI century), Rome. Maxxi (Museum of Arts of the XXI century) collection. Photo: M3S Produzioni fotografiche Roma. Image courtesy the artist. From diverse studio visits we had, I recall the work Louise (2012) be one of the favorite works of yours. Can you tell me why? What makes it so dear to you? Louise is a piece that took a long process to complete but at the same time is extremely synthetic in meaning. It represents detachment and leftover traces of a place, more precisely of a room, even more specifically of a wall in a living room. The life spent and traced on the pink wallpaper of this room has outlined the composition of a group of paintings, leaving only faded marks and small metal wall hangers. Now these 24 regular frames are in the collection of the MAXXI in Rome, which I am very pleased with. I hope others who know its story better than I do are also pleased. 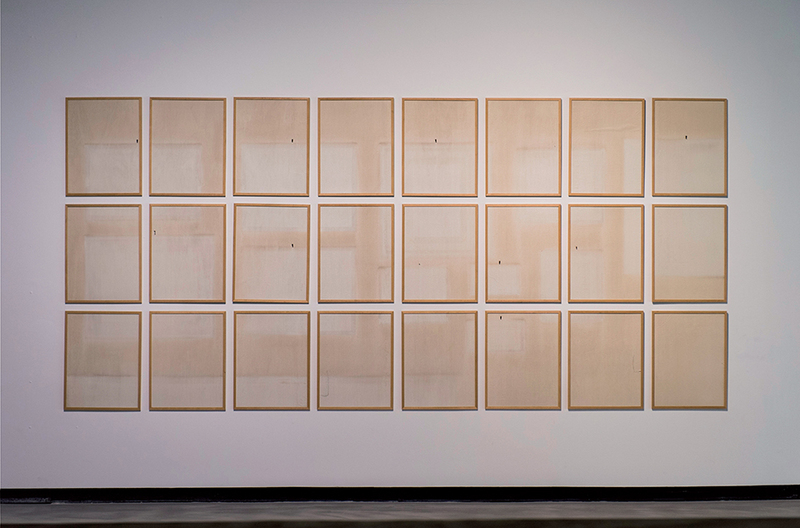 Davide D’Elia, ‘Tiepido Cool’, 2013, preliminary studies on paper, London. Private collection. Photo: M3S Produzioni fotografiche Roma. Image courtesy the artist. I am curious about your work Tiepido cool (2014), would you tell me more on this project? Tiepido cool (3) is a perceptual state, where the balance between perception of hot and cold reaches its intermediate point: cool. Normally we tend to balance the perception of hot and cold with objects in our immediate surroundings, but there are exceptions, in which a horror vacui takes over and we find ourselves living in an environment which we commonly define as Kitsch. Conversely, when the intention to eliminate any warmth around us is prevalent, we arrive at the opposite exception, where, especially in minimalist architecture, it is assumed that work places should look like morgues and desk-sized zen gardens are the only permissible decoration. The title Tiepido cool has become the common denominator of all my work where previous experiments intersect. First with warm perception (mold cultures) e then cold (anti-fouling). 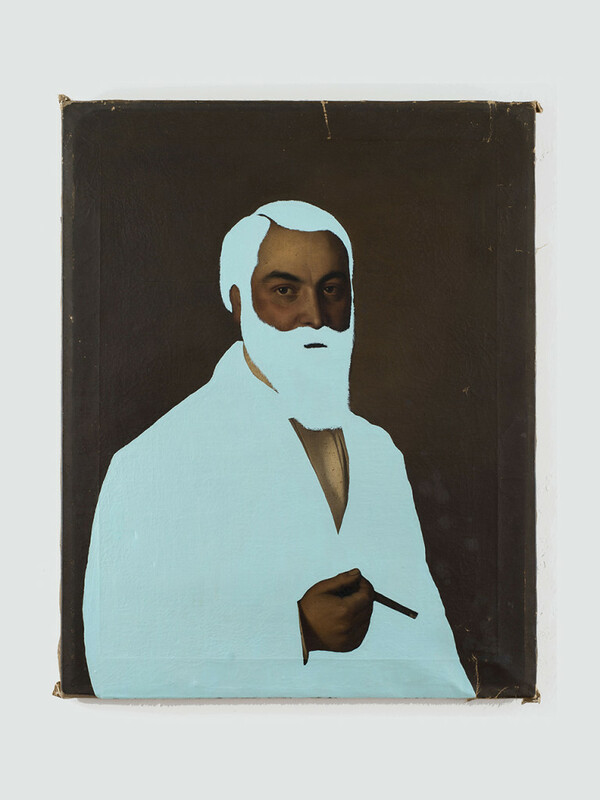 Davide D’Elia, ‘Adiutore’, 2015, antifouling paint on vintage painting. Private collection. Photo: Giorgio Benni. Image courtesy the artist. Besides your artistic research, I recall you used to work as a graphic designer. How much working with graphics has influenced your approach to the fine arts? I studied Graphic Design in the 90’s and until 2006 I worked for editorials and corporate identity projects as an art director and creative freelancer. Pure graphic design (Munari-Vignelli-Noorda) is clearly still dominant and present in all my work, and is especially evident in the colder and controlled aspects of it. I hope one day to be able to create a piece that can bridge these two worlds, which like close relatives reside within me. Davide D’Elia, ‘Adele’, 2014, ozidized old glass, enamelled glass, polygonal frame. Photo: M3S Produzioni fotografiche Roma. Image courtesy the artist. Please tell me more about your work Adele (2014). Adele is the memory of a girl’s christening dress, the white and puffy kind. I finished it in 2014, but it was started in 2006 when the little shrine in which it was conserved until that moment had broken: the dress found a new home but I kept the shattered glass that contained it and shaped it into its current pentagonal form. The slow oxidation of the fabric left a trace on the glass, which took about a century to form. Combined with a semi-reflecting and cold support, you can till this day make out the minutest details of the dress’s features, like a 17th century silver-nitrate daguerreotype of sorts. Adele is my mother’s mother. In many ways this piece is a descendant of the period in which I made Louise, which it very much resembles. Both are made with traces left by time, made evident by intervention. Both are memories embedded into geometric forms. 2 An exhibition born out of a collaboration between Andrea Bizzaro and Matteo Boetti (Bibo’s Place Gallery in Todi) with Francesca Guerrizio (Ottozoo). 3 Title of an installation that I made in London in 2011, in a group show entitled T.R.I.A.L, at Shoreditch Studios, curated and organised by Cosmic Mega Brain collective.